I absolutely adore little girls in frilly dresses. 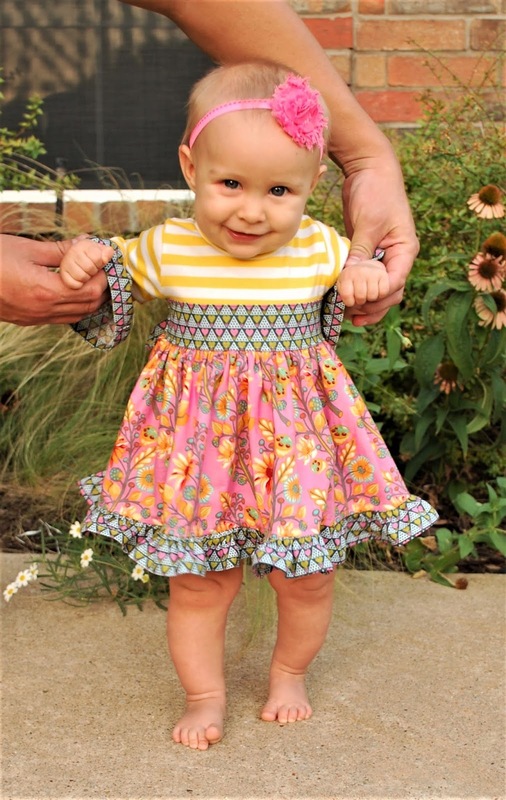 I wanted to sew a dress for my youngest that will transition well from summer to fall. I chose the Ellie and Mac Girls Play Date Dress Pattern because I wanted a knit bodice with sleeves and all the frills, but I also wanted to use up some of my quilting cotton stash. This pattern worked out perfect. The pattern comes in sizes 3-6 months up to 10 years. I made a size 6-12 months for my 7 month old. The bodice, sleeves, and neckband require knit fabric with at least 50%, 4 way stretch fabric with good recovery. The skirt, ruffles, sash, and ties are all made out of cotton woven fabrics. The bodice is really quick and easy to construct and is not overly fitted so she will have plenty of room to grow and wear the dress through the fall and hopefully some of the winter. You really have to not mind gathering if you want to sew this pattern. The sleeve ruffle, bottom ruffle, and skirt are all gathered. Some of the instructions would not be entirely clear if you are a beginner so this pattern is more suited for an a confident beginner who is familiar with hemming, gathering, and sewing on a neckband. I found all the pattern pieces fit perfectly and the pattern fit true to her measured size. The back has a waist tie that really helps this pattern to fit more than a month since babies grow so fast. I love all the ways that you can use so many fabrics in this dress. I used three fabrics total, but there are so many different combinations I could do with this pattern. The bottom and sleeve ruffles and the sash band and ties are all made out of Anna Maria Horner's Pretty Potent Family Unit in Powder. That fabric has the sweetest little hearts that I have in other colorways as well and even used on the quilt she is standing on. The pink fabric for the skirt is Tula Pink's Moonshine Sprout in Blush. The yellow and white striped knit for the bodice came from Made Whimsy in a remnant box. I couldn't find the exact listing in her shop. The dress is the perfect length on her now, and she can still crawl all around in it! Her crawling is still the scooting, pulling, army crawl, but she is pretty fast to escape during photos. I did get her to sit still for a moment while she felt of the quilt! This is a quilt that I made and blogged about here and here. Do you have a little girl to sew for? I think this would make the most darling birthday gift or baby shower gift. You can grab a copy of the pattern here. Thank you so much for reading my blog! I hope I have inspired you! You may follow me on Instagram or receive updates by liking my page on Facebook. If you want to take a look into the things that inspire me, you can follow me on Pinterest. Disclosures: This post also may contain affiliate links, which means I receive a small compensation when you purchase via my link. There is no cost to you. Any and all opinions expressed are my own.